Upper Delaware Council Elects 2019 Officers - Upper Delaware Council, Inc.
At right: Town of Delaware Deputy Supervisor Alfred Steppich, left, congratulates Harold G. Roeder, Jr. after swearing him in as 2019 chairperson of the Upper Delaware Council on Feb. 7th. 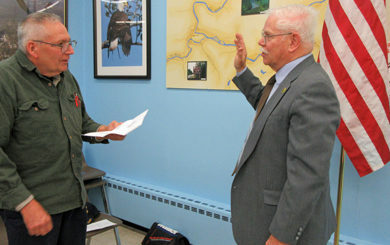 NARROWSBURG – Town of Delaware Representative Harold G. Roeder, Jr. took his oath of office to serve as 2019 chairperson at the Feb. 7 meeting of the Upper Delaware Council, Inc. (UDC). Alfred Steppich, deputy supervisor for the Delaware Town Board, officiated at the swearing-in ceremony held at the UDC’s Narrowsburg office. Along with Roeder, UDC Representatives Jeffrey R. Dexter of Damascus Township, PA, and Alan F. Henry of Berlin Township, PA, were elected vice-chairperson and secretary-treasurer, respectively, at the Jan. 3 annual meeting. This is Harold Roeder’s third stint as UDC chairperson, having previously filled that role in 2000 and 2010, and serving as vice-chair in 2009. He succeeds 2018 Chairperson Aaron I. Robinson of Shohola Township. Roeder is now in his 22nd year on the Council after the Town of Delaware appointed him as its UDC voting delegate in 1997. The 78-year-old moved to the Town of Delaware from Queens at the age of 12 in 1952, graduated from Delaware Valley High School, and earned Bachelor’s and Master’s degrees in Music Performance from Ithaca College. Past employment included working as a music teacher at Roscoe Central School and music instructor at Ithaca College, and as proprietor from 1960-86 of Roeder’s Pianos and Organs which sold, tuned and repaired those instruments as the largest distributorship in the Hudson Valley. In 1988, he earned his real estate license and from 1992 until his 2015 retirement, he operated Roeder’s Appraisal Service as a certified general real estate appraiser. His son, Brian, has taken over that business. Roeder was appointed Town of Delaware Councilman to fill a vacancy on the board in March of 2009 and won subsequent elections through his resignation in January of 2015 when Roeder and his wife, Donna, moved from Hortonville across the river to Welcome Lake, PA. Appointments to the bi-state UDC organization are made at the prerogative of the member municipality without residency requirements. Roeder has been a long-standing member of the UDC’s Project Review and Operations Committees, as well as the Government Officials Liaison Subcommittee. The classically-trained Roeder enjoys “serious music” and “dabbles” in musical composition. He is a sportsman who enjoys angling for trout in the Callicoon Creek, shooting sporting clays, and belongs to the Pleasant Valley Hunting Club. The Roeders are the parents of Hal, Katrina, and Brian. They have nine grandchildren and three great-grandchildren. Jeff Dexter will serve as the Council’s vice-chair in 2018. Dexter, who was instrumental in Damascus Township’s July 21, 2008 decision to join the UDC, was appointed as first alternate representative in January 2010 before assuming the UDC representative position in 2012. He served as the Council’s vice-chair in 2012, was elected as chairperson in 2013, became secretary-treasurer in 2015, and was vice-chair again in 2016. He is a member of the UDC’s Project Review and Operations Committees, and the Personnel Subcommittee. The Cochecton, NY native graduated from Narrowsburg Central School in 1967, earned a 1971 Bachelor’s degree in Resources Management from the College of Forestry at Syracuse University, and had a 31-year career working in the Arizona State Parks System before returning to the Upper Delaware River Valley after his 2003 retirement. Dexter retired from the Damascus Board of Supervisors in 2015 following a 10-year tenure, including six years as chairman. He was appointed to a six-year term as Township Auditor effective Jan. 4, 2016. He is the Volunteers-in-Mission Team Leader for disaster recovery projects through the Damascus Methodist Church, the sponsor’s representative to the Northeast Council of the Boy Scouts of America for Troop 122 in Damascus, is active with the Damascus Volunteer Ambulance Corps, and belongs to numerous local historical societies. Jeff and his wife, Linda, built their log home in Damascus. They have three children: Kari, Bethany, and Jonathan. Al Henry was appointed by the Berlin Township Board of Supervisors as its UDC delegate on Jan. 3, 2012. He chaired the Council in 2015 after having served as its secretary-treasurer from Aug. 1-Dec. 31, 2013, then again in 2014, and the past three years of 2016-18. He sits on all three UDC standing committees (Water Use/Resource Management, Project Review, and Operations) and chairs its Personnel Subcommittee. A native of Beach Lake, PA, Henry was employed by the National Park Service (NPS) for 32 years, all but two years of that tenure with the Upper Delaware Scenic and Recreational River, before retiring on June 1, 2009 as Chief Ranger. In addition to extensive law enforcement credentials, Henry earned certification as an NAUI Divemaster, served as a volunteer firefighter, and coached baseball and soccer locally. Henry has recently worked for Northeast Wilderness Experience as a guide for river and hiking trips and for 3 B’s Indoor Shooting Range in Honesdale as a firearms instructor. He also helps maintain his family’s 300-acre Village View Farm property in Beach Lake, and is a member of the Beach Lake Hunting and Fishing Club. Al and his wife, Karen Carlson, are the parents of Alana and Dylan. They are grandparents to Beau, the son of Dr. Alana and Bart Rickard. Established in 1988, the Upper Delaware Council works in partnership with the National Park Service to oversee implementation of the River Management Plan for the Upper Delaware Scenic and Recreational River. The U.S. Congress designated the 73.4-mile-long, 55,574.5-acre corridor which starts below the confluence of the East and West Branches of the Delaware in Hancock, NY and extends to Railroad Bridge No. 2 in Mill Rift, PA, to the National Wild and Scenic Rivers System in 1978.